Or as Sarah Palin would say: Good riddance to bad rubbish also. Yes, Sarah Palin, hater of people who complain about negative media coverage, has left public office due to her negative media coverage, and, y’know, lil’ ol things like ethics investigations. Also. 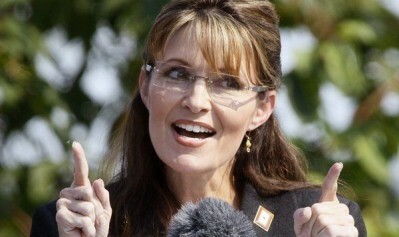 And before you go thinking that I’ve jumped on some sort of anti-Palin bandwagon here, I refer you Exhibit A*. As you can see, I’ve not so much jumped on the anti-Palin bandwagon as leapt onto the front seat, hoiked up the reins and cracked my whip on the horses. And I like horses. Personally, I don’t believe the speculation that she may make a 2012 Presidential bid; instead, I wouldn’t be at all surprised if she leaves politics and takes up a lucrative position as a TV host. At least that way she won’t have as much power. No. Wait a minute. Dang! Anyway, Sarah: thank you for stealing the limelight away from my birthday. Remind me to release my second album on the day you announce your Presidential bid/Fox anchor job/sixth pregnancy surrounded in intrigue and mystery. That’ll show ya! Also. *Exhibit B: Collection of ‘Palin Into Insignificance’ and ‘I’m with the moose!’ badges.